Another conversation between Idealist and Pragmatist where, in the context of the narrative, Pragmatist sounds reasonable and Idealist sounds obnoxious. Magik is expendable? Really? (Actually i'd have thought she might be one of the few unaffected by this whole "new timeline" thing, since her Limbo hopping means she's temporally disjointed at best. Fair play to Inferno though, hating the X-Men for having (at least) three different Beasts running around at the same time seems entirely fair. 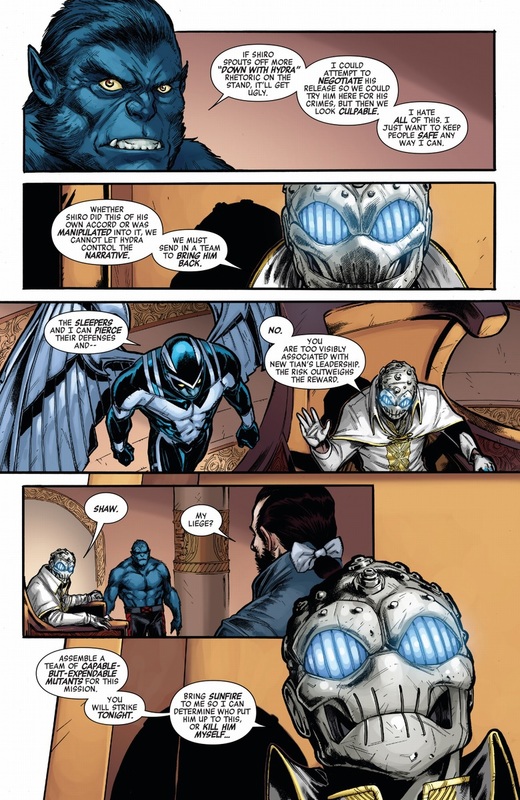 Didn't Bendis kill off Darķ Beast? For just one lovely moment I thought they'd rescued Rusty Collins instead of Toro, and the artist had just messed up his hair color. Speedball kind of has the Flash problem -- if he was written correctly he'd be practically unstoppable. We can infer that Shaw considers Magik expendable? 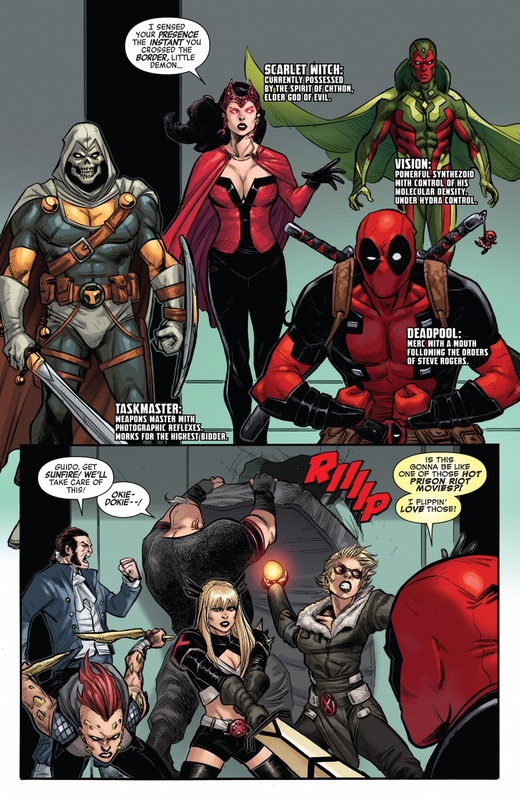 Magik being expendable is... odd, to say the least. You only have so many teleporters, and Illyana is powerful enough to move freakin' buildings around. Actually, Speedball was choked unconscious in his original series. Maybe his field just doesn't work beyond a certain threshold? Well, it's not really a "new timeline" in the normal sense. History's still the same, it's just Cap's been transformed into an evil version of himself, complete with a retroactive history that only he remembers but to the rest of reality never happened. It's... sort of... like if he was killed/kidnapped and replaced by an alternate reality version of himself. ...Hey, just like Dark Beast did to Beast, just to take it all full circle! Strong Guy is back? 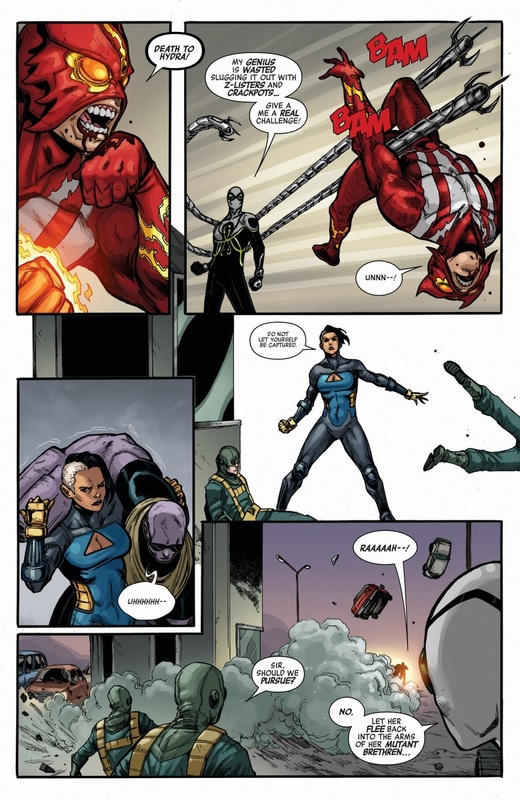 So this is just some more "Age of [Apocalypse/X/Ultron]" alternate reality nonsense? 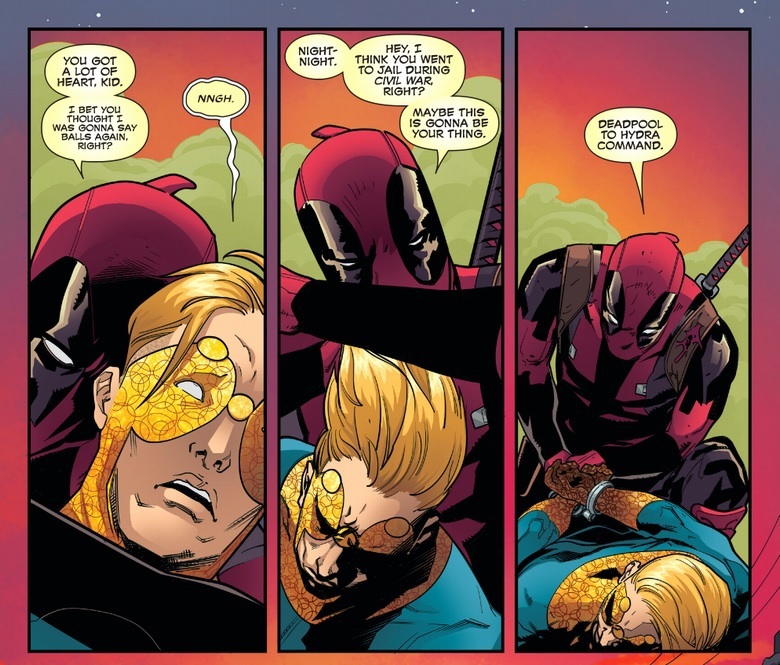 Better to be on the inside in such a situation, makes it more likely he'll be able to kill Steve should the need arise? 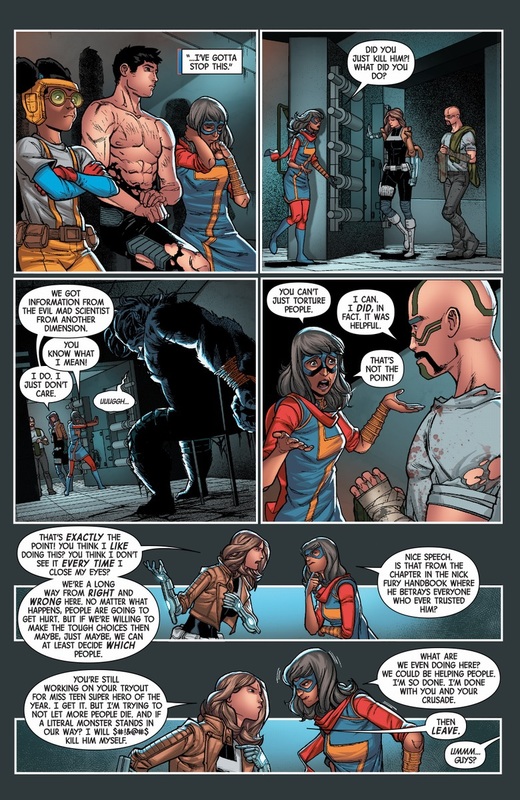 I love how nonchalant Taskmaster is when he realises he can't win. There's something very funny about a villain just shrugging and wandering off because fighting is too much hard work. It wouldn't be the first time Taskmaster's decided to sit stuff out. 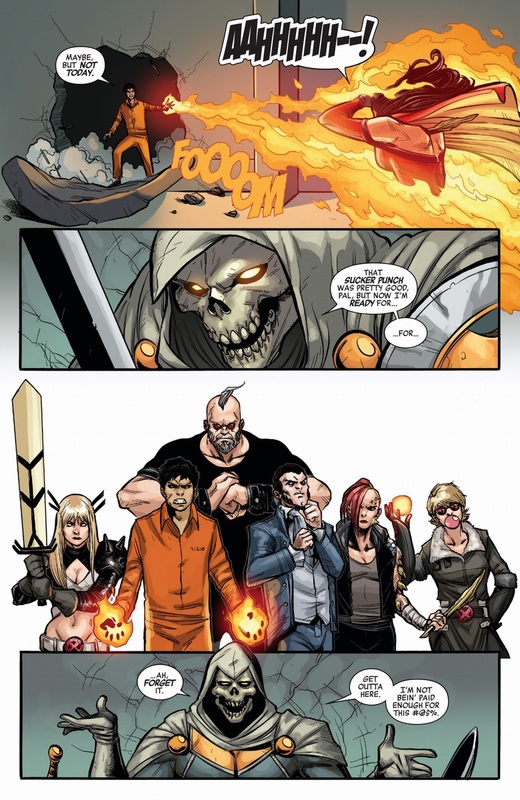 That's Taskmaster for you. He is dangerous, he's a villain, but he's not a fool. I don't think he can hurt Shaw, let alone take that whole team. Yeah, I rather enjoyed that part. I've been enjoying him a lot lately, truth be told. Does Sunfire have a Nova Blast thing like Torch does? He never uses it if he can. I don't think so, no. Though he's still a pretty strong pyrokinetic. I guess no one remembered that Dark Beast was killed off years ago. This has stopped anybody when? 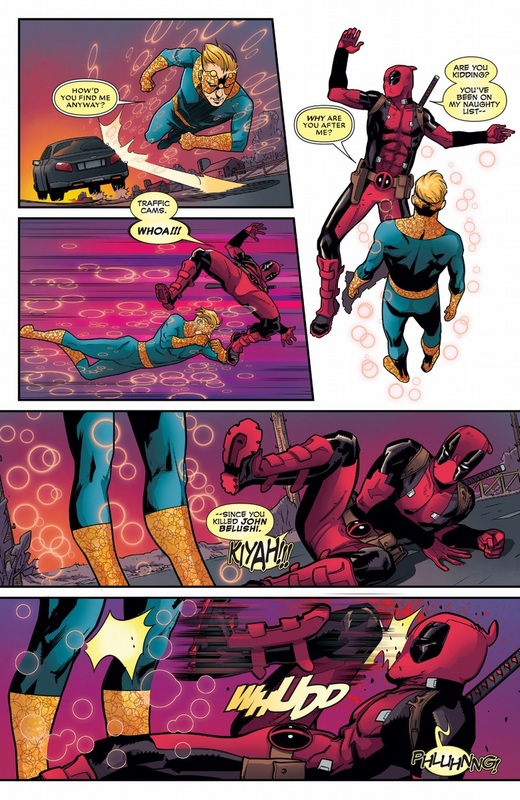 Even Gwen Stacy got to cheat death briefly. Strong Guy sure has shown up alot lately. Which is weird, as at the end of the first X-Factor mini he all but disappeared. Now he' a crowd shot standard. Which is odd, given that his last act on an X-team was killing the child of a teammate. Hey Beast- uh, normal this-direction Beast, are you telling me that making decisions for the mutant race is hard? You might want to think back to your interactions with Scott. Also, Wade has a good point- Hercules has a techno monocle? Sebastian Shaw is a lackey, now? That seems something of a drop in status, I guess. I'd ask which Xorn that is, but then someone would have to tell me and...well, maybe I don't need to try and untangle that knot. One thing that is REALLY bugging me in this event so far: torture is presented as EFFECTIVE. And it's historically been shown that IT IS NOT. Depending on the situation, it either generates outright fabrications to make it stop or incorrect information because it is obtained under duress and often under mental hardship, which causes the subject to give incorrect information because they've been tortured and and can't remember correctly. This is the second comic in this event where torturing someone is discussed as effective and it's presented as the hero is naive for thinking it is not. 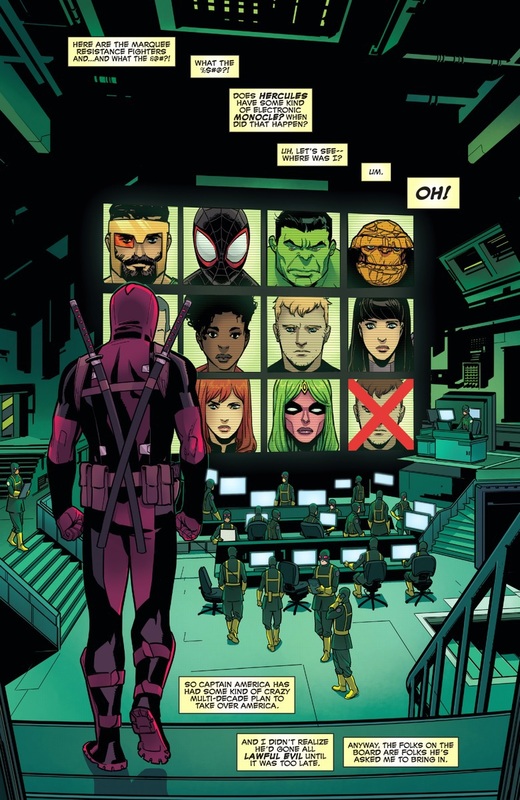 Never mind that in Secret Empire #4, we see that they Hydra agent isn't broken, so any information they got was probably tainted to begin with. It's like when the TV show '24' kept using torture as a way to get terrorists to reveal information and the CIA asked them to stop, as they'd already discovered post-9/11 that it didn't work. We got very little useful intelligence that way, but we did ruin our standing globally and stained our souls to no good end. This isn't a 'hard men/women for hard times' argument, it's just using a lazy trope. This is the sort of writing I honestly think qualifies as dangerous. Spreading the idea that torture is effective is a bad, bad thing to do.